Among chain restaurants and fast-food places, a few companies stand out as especially attractive investments to buy for growth right now. Eating out is big business. Americans spent $54 billion at bars and restaurants in June, according to the latest figures, beating the $53 billion they shelled out at supermarkets. From fast-food chains to fast-casual to sit-down dining, the industry is benefiting from the trend. Investors seeking to profit from the long-term shift away from cooking at home have options that range in business models, growth potential, and valuation. Below, we'll look at the top restaurant stocks by market capitalization, and zero in on what makes a few of them the most attractive buys right now. What are the top restaurant stocks? With nearly 40,000 locations across 100 countries, McDonald's (NYSE:MCD) is by far the biggest presence in the industry. The fast food titan generated $25 billion of revenue in 2015 and cleared $4.5 billion in profits that year. The resulting 18% net margin makes Mickey D's one of the most profitable businesses on the market. *Annual sales figures are for the prior 12 months. Source: Yahoo Finance. Investors can choose from traditional sit down setups like the one employed by Olive Garden owner Darden, or fast-food providers like McDonald's and Yum! Brands. The fast-casual restaurant segment is a growing niche that includes companies like Chipotle or Panera Bread. Corporate ownership is a key differentiation point for these businesses. McDonald's owns less than 20% of its locations and aims to push that number down to just 5% through selling company-owned stores to franchisees. The franchised setup produces steadier revenue and cash flow for headquarters but carries important drawbacks such as lack of control over staffing, marketing, and pricing decisions. On the other end of the spectrum is Chipotle, which owns all of its 2,100 locations. That level of tight control provides flexibility for management to make wholesale strategic changes quickly, as the chain is doing right now by raising its food safety standards. Yet, without franchisees chipping in steady rent and fees, Chipotle's revenue and profits are completely dependent on the popularity of its menu. Buffalo Wild Wings sits right in the middle with roughly half of its locations company-owned. Customer traffic growth forms the foundation for a restaurant stock's success because the economics of each existing location improves as it handles additional transactions. High traffic also confirms that the menu and pricing approaches are resonating with customers, which suggests the company has room to expand its store footprint. Starbucks provides a great example of these virtuous circles at work. The beverage giant logged 7% higher comparable-store sales last year, split between 3% higher traffic and a 4% boost in average spending as it broadens its food menu. Combined with a growing store base, that comps growth powered a 17% spike in revenue as profitability ticked up to 19% of sales. Panera's strong recent growth makes it a good candidate for long-term investors. As CEO Ron Shaich put it recently, "At a time when other restaurant companies are feeling the impact of a slowing consumer environment, we are maintaining our momentum." Panera's 4% comps gain in Q2 trounced rivals, indicating the sandwich and soup specialist is poaching market share from rivals. Yum! Brands also looks appealing at just 27 times expected earnings. Sure, sales growth has slowed in its key Pizza Hut and Taco Bell segments. 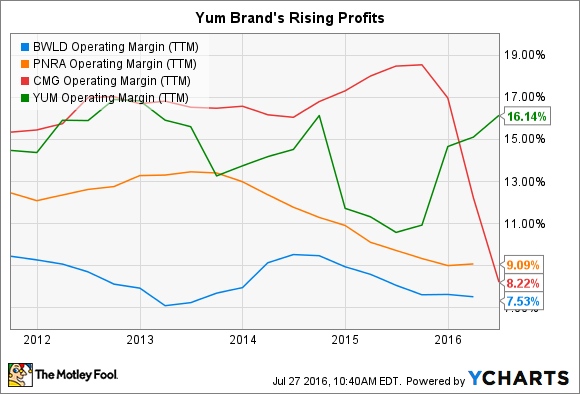 But YUM is still growing into a fundamentally more profitable business, with margins climbing toward 20%. Operating margin is up to 14% of sales through the first half of 2016, up from 12% last year. On top of those earnings gains, investors can expect significant cash returns as YUM raises funds from the spinoff of its China division this fall. Given the wide range of choices in this industry, it can seem difficult to find the best stock investments. But focusing on a few key metrics can help investors weed out those weaker businesses, leaving just the restaurant chains that are best positioned to capitalize on the long-term trend toward eating out more often.